MEANING OF NAME: Originally known as Tan Sri, which is the name of his owner from the Mini Zoo Hot Springs Tawau, he has been re-named as “Sunbearo” in recognition of all the enabling support that the company, Neways has given to the centre. HISTORY: Sunbearo was kept in a Mini Zoo Hot Springs, Tawau, South Eastern of Sabah before he was handed over to the Sabah Wildlife Department and BSBCC. Sunbearo was thin and weighed only 11.6kg. PERSONALITY: Sunbearo and his friends took their first step out into the forest enclosure on the 24th of December, 2015. Sunbearo enjoys his daily playtime in the forest with his buddies Montom, Susie, Loki, Bintang, Kala, and Damai. He never stops being curious and always wants to explore and touch anything he can. He loves to pick a favourite spot and sunbath in that spot with enjoyment on his face. Sunbearo's hesitant, curious and expressive face made him stand out from the start. Sunbearo is a foodie. When food is coming, Sunbearo will growl and give a warning bark at the other bears to show he wants to get the food first. He likes eating very much and he is not particular about the food he eats. 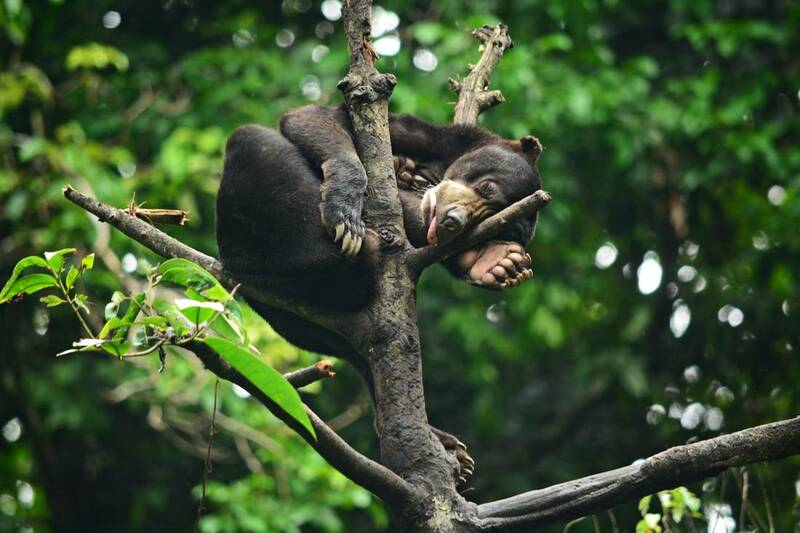 He is still learning the necessary skills to make him become a wild sun bear on his own! IDENTIFYING MARKS OR TRAITS: He has a special tiny "V"shape on his chest mark. Huge thanks to Neways International (Australia) Pty Ltd that adopt and naming Sunbearo.Your support and contribution enables us to care for this orphaned sun bear.